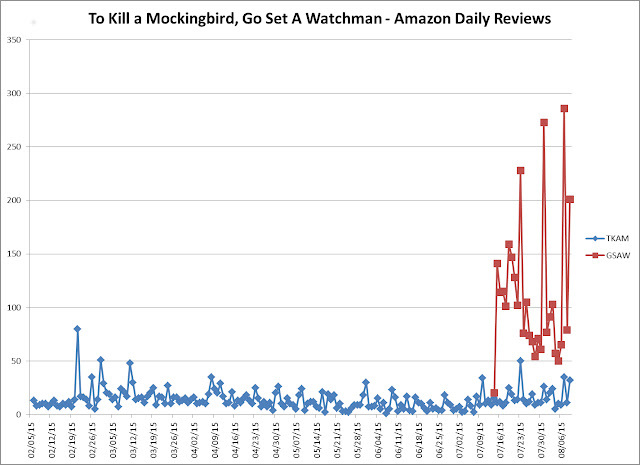 About a month ago (July 14, 2015), I looked at how some statistics for Harper Lee’s “Go Set a Watchman” and “To Kill a Mockingbird”. In this blog I will update them, now that some time has gone by. To Kill A Mockingbird is Harper Lee’s well-loved novel, first published in the 1960’s, set in the 1930’s southern U.S.. It deals with race relations in that time and place. Go Set a Watchman is the sequel or prequel, depending on your point of view, to that novel. It moves ahead about 20 years in time, and revisits the themes of race relations and family dynamics. Below is an Amazon Ranking graph for both books. As you can see, both books “touched down” in the Top 10 in mid-July, when Watchman was first published. Watchman hit number one, and stayed there for about two weeks. Since then it has moved into the teens. Mockingbird is back up to about 50. Its long term default spot seems to be in the 300 to 500 range, at least over this year. The recent trend is made clear in the second graph, below, which keys in on the period after July 10. 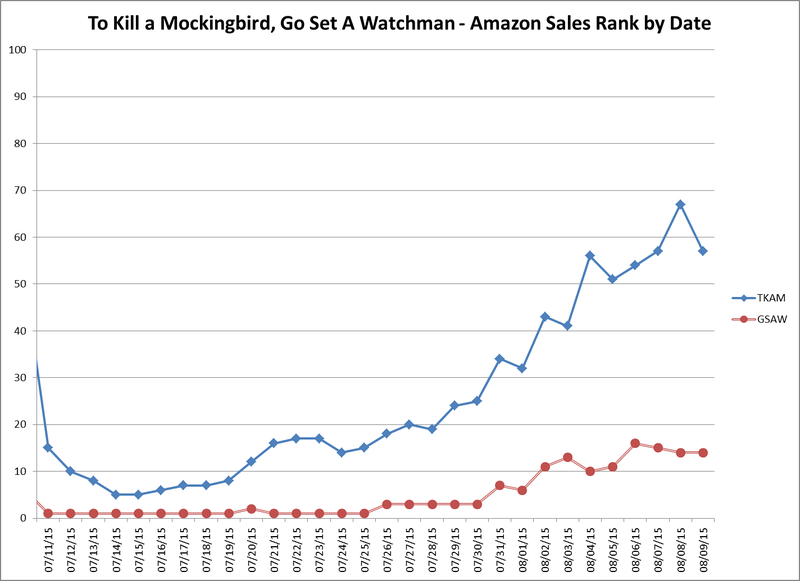 Watchman was formally published on the 14th, but there were pre-orders allowed, since mid-May, thus its rank was already number one before its official launch. That formula is based on the crowd-sourced “Data Guy” lookup table, which correlates daily sales and sales rank. Essentially, it is just a smoothed version of that table, utilizing a power law function. It is generally acknowledged that power laws are the usual statistical function that best describes data such as book sales. Note that the function may estimate somewhat high in the first few ranks, as the “Data Guy” table seems to depart somewhat from a power law at the upper end of the range. A large number of Indie writers contributed to that table, exchanging information about how their daily sales affected their books’ rankings. That data was then aggregated into a lookup table, which estimates how many book sales correlate with various sales rank ranges. Though it is far from a perfect estimator, studies have shown that crowd-sourced data is usually quite reliable, so we will use that relationship. We expect that it will be a fairly decent approximation of the underlying reality. 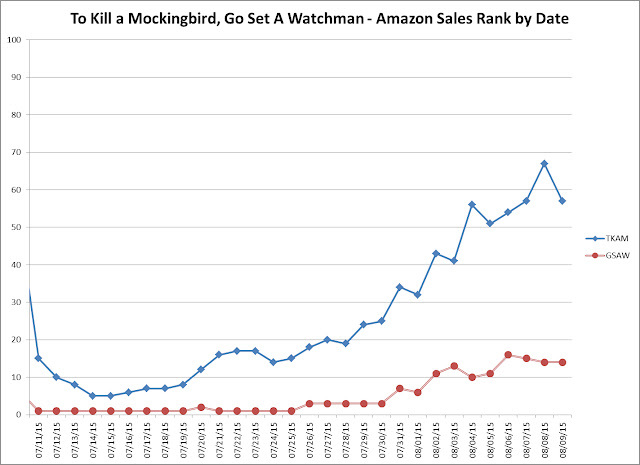 Go Set a Watchman has had about 397,000 sales on Amazon, since pre-orders started in late May. (May 20 to August 8, 2015). That adds up to over 500,000 additional Harper Lee books, sold on Amazon alone, since the decision to publish Watchman was made. The publisher is getting top dollar for these books. Mockingbird has generally been selling for about $10 and Watchman for about $15. That means about $5 to 7$ million dollars. If we assume a relatively equal split between Amazon, Harper Collins, and Harper Lee, then that comes to about $2 million each. This doesn’t include sales from other sources (e.g. Barnes and Noble), which would likely be considerable in this case. 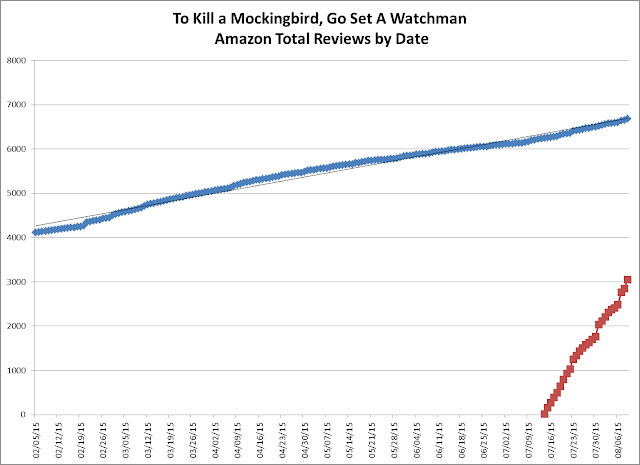 The graph below shows the number of reviews that each book has received, since their Amazon kindle publication dates (July 2014 for To Kill a Mockingbird and July 2015 for Go Set a Watchman). 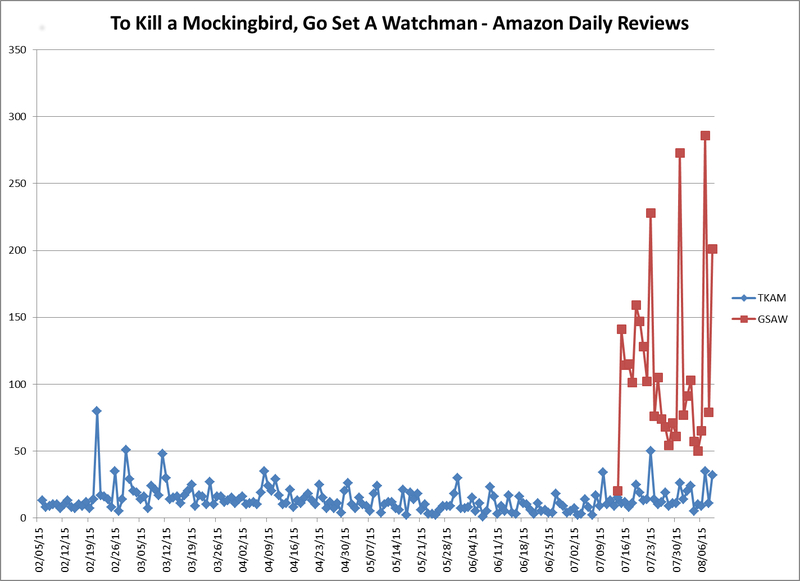 As you can see, the number of reviews for Watchman in the past month approximately equals the number of reviews for Mockingbird since early in the year. 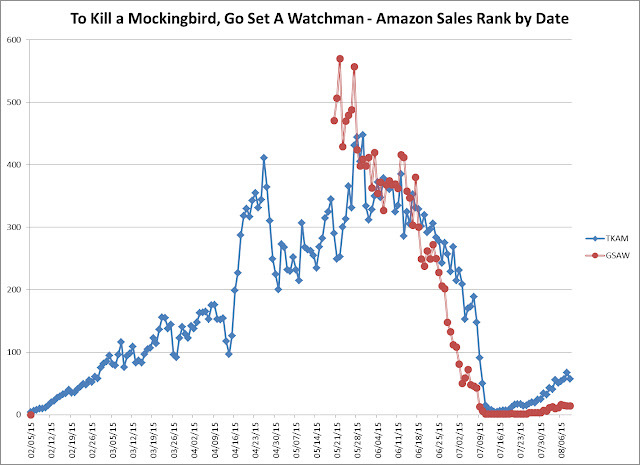 Clearly, Watchman has attracted much more attention than Mockingbird, in the recent past. That conclusion is reinforced by the second graph, which shows the number of reviews per day. Mockingbird tends to be in the 20 per day range, while Watchman is generally over 100 per day, though that appears to be dropping. If we look at reviews per book sold, however, it seems that Mockingbird is still more engaging to readers. On average, 1.47% of Mockingbird copies sold since February were reviewed, while only 0.77% of Watchman copies were reviewed. Those numbers could change for Watchman though – there is a time lag between buying and reviewing, so Watchman might catch up. Mockingbird, given its time on the market, is in more of a steady state condition in this regard. Mockingbird is also much preferred by readers, in terms of its Amazon rating. It holds a steady score of about 4.7, a very high score indeed. Watchman has dropped from 3.9 in July, to 3.7 in August. Clearly, readers are not as impressed with Watchman as they are with Mockingbird. That’s no surprise – I doubt anything could have compared with the classic To Kill a Mockingbird. Was publishing Watchman a good idea? That’s a matter of opinion. Clearly it has made a fair bit of money, though it probably won’t be the long term hit that the publisher and the book industry in general was hoping for. That seems clear from the fact that it couldn’t nail down the number one rank on Amazon for more than a couple of weeks. Harper Lee was able to have a second book published during her lifetime – surely that is something most writers would want to have happen, “literary legacy” or not. Readers got a chance to read another work by Harper Lee. They might be disappointed that it doesn’t reach their expectations, but that’s how it goes. Perhaps it is better to risk disappointment, than to never know for sure.